Jim Baen Memorial Award – presentation. I know this photo has already shown up on facebook, but still. 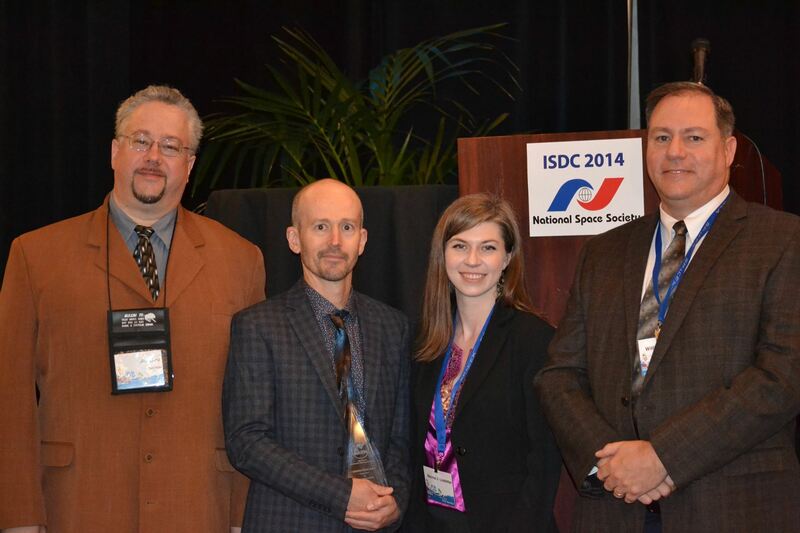 It was my priviledge last week to receive the Jim Baen Memorial Writing Contest Award at the International Space Development Conference in L.A. I’m the little guy without hair and the bugged eyes (stunned? I think so). On my right is Jim Minz from Baen Books, and on my left are Marina Lostetter and William Ledbetter (both Writers of the Future winners). It was great to hang out with such esteemed company at the conference and talk writing and sci-fi and all things good. This entry was posted in fiction and tagged Baen books, International Space Development Conference, Jim Baen Memorial Writing Contest Award, Jim Minz, Marina Lostetter, short stories, william ledbetter, writing contest on 21 May, 2014 by Sean Monaghan. Super congrats, Sean! An award well-deserved. Getting awards is an awkward thing, like an out-of-body experience. Couple years from now, you’ll be used to it. Thanks Erin. It sure was surreal. Congratulations~! You will see many more I am sure. Thanks Chris. I’m sure working on it.